There’s absolutely nothing wrong with a traditional slice of pizza. Lots of people enjoy their pizza with nothing but the usual cheese, pepperoni or sausage. But maybe you want to walk on the wild side a bit and try something more unique. The Hangover Pizza, photo courtesy of Slice of Vegas. If you’re in Vegas there’s a good chance that during your visit you’ll have a hangover at some point. Everyone knows food is one of the best cures and Slice of Vegas has created a pizza that might help. 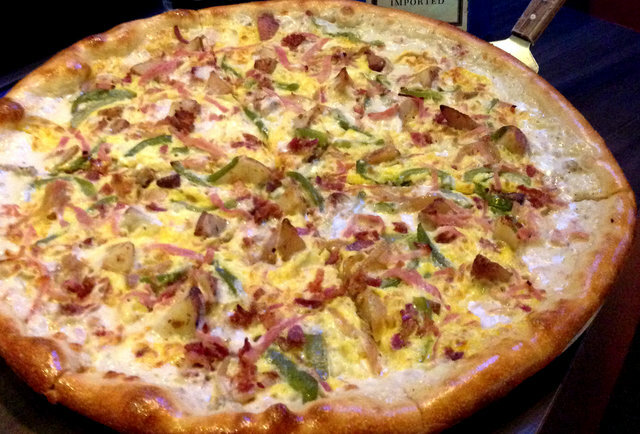 It’s topped with sausage gravy, cheddar, mozzarella, green peppers, onions, potatoes, bacon, ham and scrambled eggs. 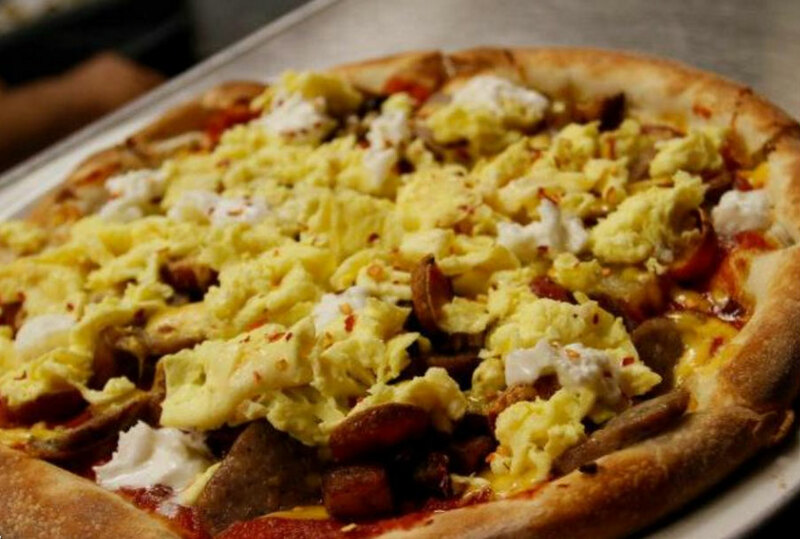 It’s basically the best of breakfast in pizza form. The Stinger seems a bit like a mix of Buffalo wings and Philly cheesesteak all wrapped up in a pizza. It’s topped with roast beef, chicken fingers, sweet & hot peppers, onions, blue cheese dressing, cheddar and mozzarella. This one’s not for the faint of heart. If you like things spicy, this pizza at FIVE50 will heat you up with ghost chili salami, shisito peppers, Calabrian chili and roasted sweet peppers. The Zuca pizza, photo courtesy of Flour & Barley. This pie at Flour & Barley is a great way to get your veggies in delicious pizza form. 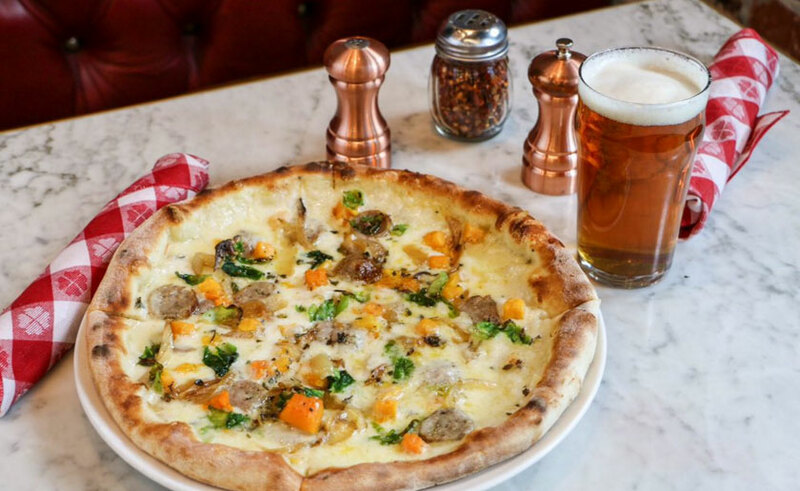 It’s got butternut squash, Brussels sprouts, roasted onion, fontina cheese and fennel sausage. The St. Anthony, photo courtesy of Pizza Rock. Pizza Rock is known for making a large variety of different types of pizza and they’ve got several unique choices on their menu. We like the quail egg white rose potato guaniciale pizza. It’s topped with mozzarella, white rose potatoes, chorizo, pork cheek, rosemary, fromage blanc, Calabrese peppers and lavender sea salt. If you like the combination of beer and pizza, you’ll also want to try the Sausage & Stout made with honey malted Guinness beer dough, house-made mozzarella, beer sausage, caramelized onions, fontina, green onions, crushed red peppers, beer salt and sweet Guinness reduction. It serves two and can be paired with Guinness beer to drink. Another interesting choice is the St. Anthony, made with housemade link sausage, Italian fennel sausage, garlic, roasted peppers, ricotta, hot pepper oil, basil and farm fresh egg on top. We usually don’t think of seafood as a topping for pizza, but why not? If you love seafood, you should try this pizza at Metro Pizza, which is topped with grilled shrimp, calamari, mozzarella, spicy tomato sauce, parsley and fresh lemon wedge. 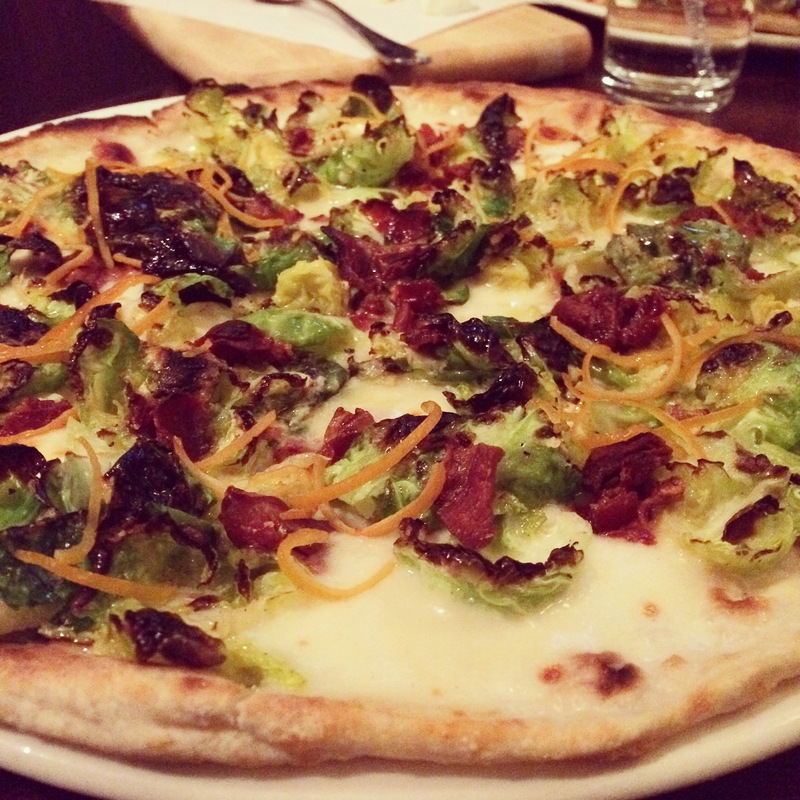 Brussels Sprouts pizza at Otto Enoteca, photo courtesy of Vox Solid Communications. Are you one of those people who have never tried Brussels sprouts? Now’s your chance. The Brussels sprouts pizza at Otto Enoteca Pizzeria features roasted the roasted sprouts, mozzarella, prosciutto and preserved lemon. Did we mention that Otto is from Chef Mario Batali? Trust us, he knows how to make a pizza. The Dillinger, photo courtesy of Las Vegas Weekly. 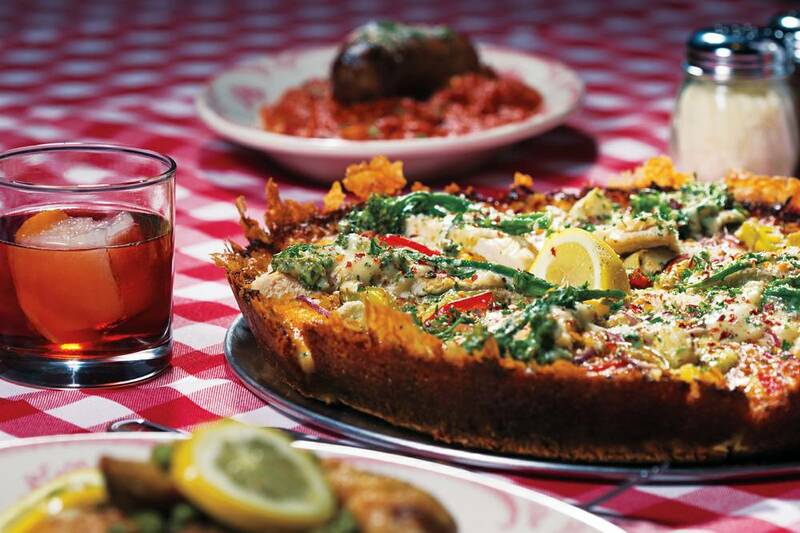 This award-winning Chicago cast-iron pizza is topped with lots of amazing stuff and it’s just plain delicious. It’s got smoked vodka cream sauce, marinated chicken breast, bacon, bell peppers, mozzarella, Provolone, cheddar, artichoke hearts, broccolini, garlic, fresh lemon, crushed red peppers and parsley. If you’re a serious carnivore you’ll love the Roman Pizza. It is topped with all of Pizza Forte’s Hoffman hot dogs and sausages (seven total). The sausages are jalapeno and Italian sausage and the hot dogs are German (traditional pork and beef), beef, snappy (veal), cheddar stuffed sausage and Kielbasa. You might need something a little sweet after all that savory sausage so stick around for Pizza Forte’s dessert pizza, which is topped with homemade cannoli and fresh fruit.